Eki fetches me at a corner by the Helsinki Central railway station. He arrives right on time. There he is, this 79 year-old gentleman of fair hair and blue eyes, technically a stranger up to that moment despite more than a year of email contact, smiling at me and driving me out of town, heading west, past Espoo, to an interesting, architecturally very innovative museum on Finnish nature. It is immediately apparent that this almost octogenarian is deeply grounded in his Finnish roots. He has spent three years of his working life in London, from 1967 to 1970. And he is, truly, one of the travel pioneers, one of the adventurers who broke new ground in an era well ahead of mine. What surprises me is his simplicity, his kindness, and his keen interest in the images of flora and fauna from the north of his admittedly beautiful native land. We have lunch, he insists on buying, and we talk about our lives. He is a rich man in terms of family, with a number of grandchildren who he is obviously proud of. The best part is yet to come. We drive to his home, past endless expanses of tall trees. A significant honour, I feel, to be invited to a Finnish home. His elegant, equally friendly wife has prepared a wonderful berry cake especially for me, as if my status as a world traveller should somehow be celebrated. But when Eki gets out his stack of self-created travel logs, and neatly piled maps, it is I, continuously in surprise, who will be gobsmacked. 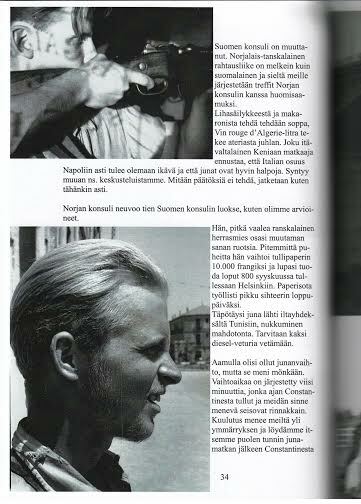 Eki Siivonen made his first solo trip on his bicycle back in 1948. He wasn’t quite 13 years old at the time. It may not have taken him out of the country, but it was his first peek into a world that he would soon conquer and a first taste of the road, the liberty and the adventure that his exterior may not immediately reveal he loves. 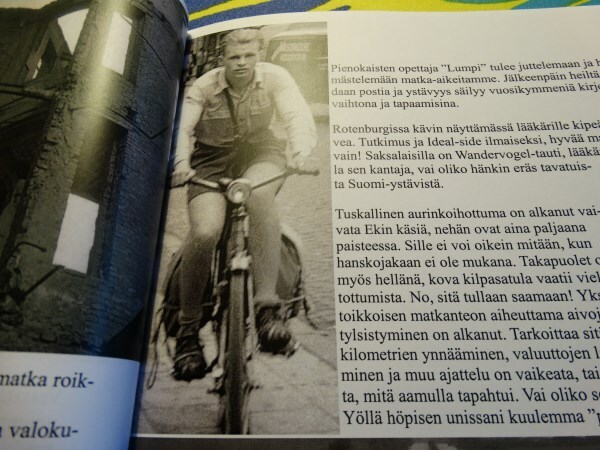 He then shows me a different journal, written in Finnish like all of them, with black and white photos of the first international bike trip, to Sweden and Norway. This was only two years later, in 1950, and he was accompanied by another friend. 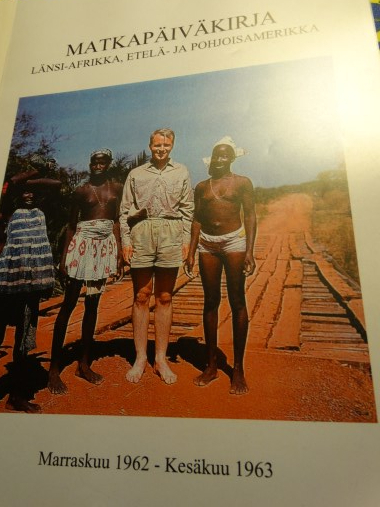 A photo of someone who is clearly not from Finland appears – an Indian they met on the road, another pioneering traveller of a different time. He’s dead now, Eki says rather factually. They actually kept in touch. 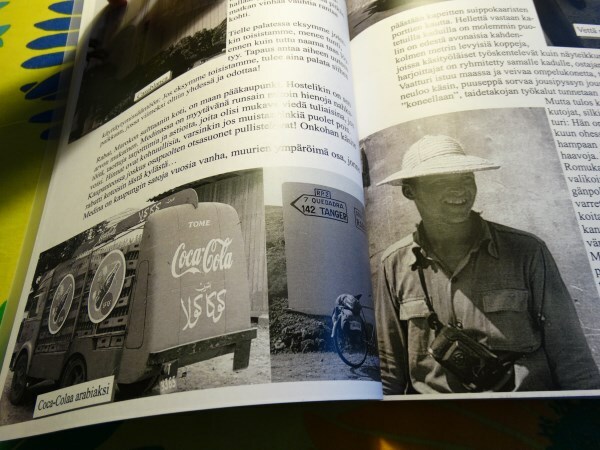 Eki’s books continue through the years, including fascinating black and white photos of French Algeria in the 1950s and of Vienna with road signs in Russian, before the departure of the Soviet troops. Gradually the bicycle was replaced by a motorbike, with which he went around the Eastern Mediterranean in 1955. 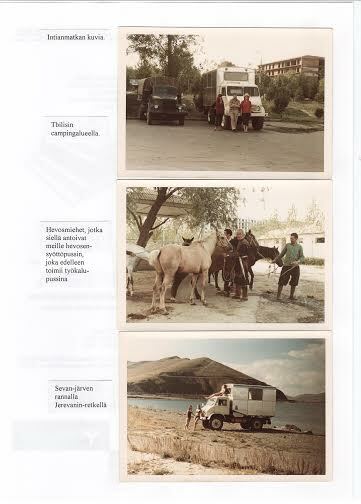 And then, with a Volkswagen van, starting in 1962, made a 7-month journey of a lifetime, down from Europe, over the strait of Gibraltar and through Algeria, just independent, Mali and Guinea to Dakar. Eki and his Finnish fellow traveller waited for 7 weeks to be able to get a boat that made it across the Atlantic to Brazil. In my favourite photo, a young, blonde Eki is smiling innocently next to a bare-breasted native woman in Guinea. Once in South America, their Volkswagen needed constant repairs, breaking down again and again through the muddy terrain and non-existent roads in Brazil and Bolivia and as far as Bariloche in Argentina. Eventually they made it over to Colombia, from where another boat took them and the heroic vehicle to the United States. Photos from 50 years ago give off a sixties look of development in ‘modern’ USA that is impossible to resist. There are more memories, some in the books, some in his narrative. Newer travel logs, most in colour by now, show a group of older people in Russia and Belarus, always exploring new routes that are hard to get to. 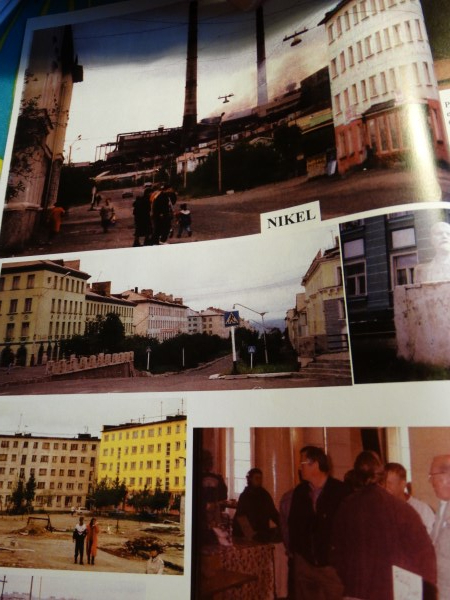 Even Nikel, the out-of-bounds Russian mining town near the Norwegian border, has somehow made it on the itineraries. 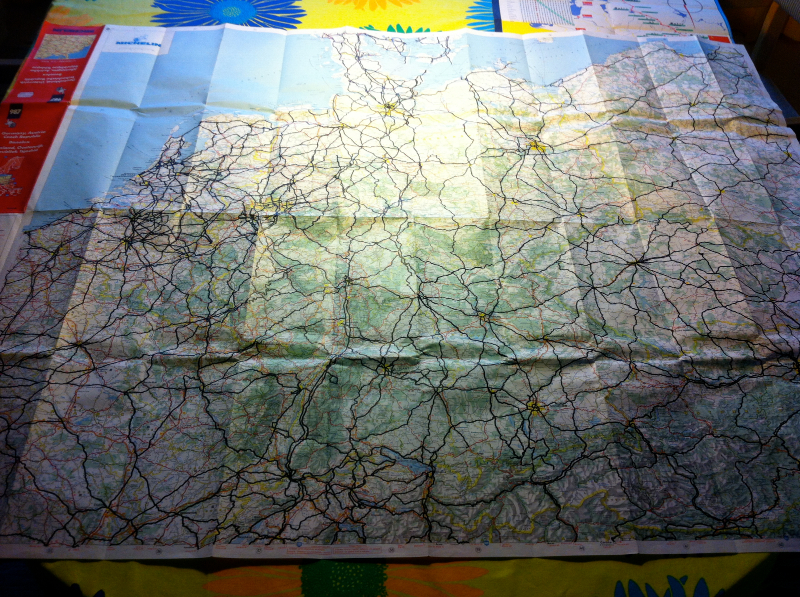 Eki shows me his massive foldaway maps. He has detailed maps of most European countries, on which he has traced, in thick black felt pen, all the routes that he has driven. Nearly all of central Europe is entirely black, almost every main road and most secondary ones having been passed, sometimes in the company of his wife, who seems to enjoy travelling just as much and doesn’t show any sign of surprise at the fact they have driven through communist lands so often. Yes, especially impressive are his forays into the former Soviet Union. At a time when few would ever consider even visiting Moscow, Eki drove his car all the way through to Sochi. 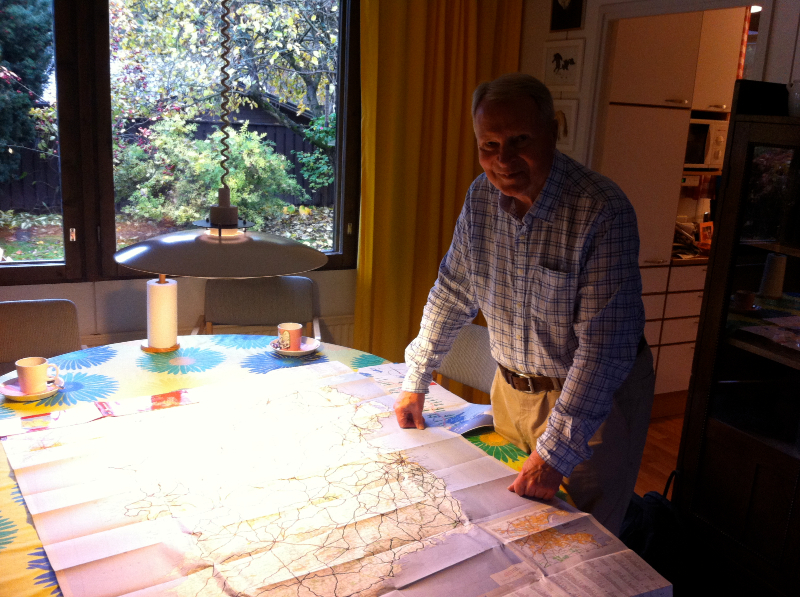 He shows me maps from the 1960s of the routes that were allowed for foreigners to drive on. The Baltic States are notably not included – they appear entirely off limits. A truly different world to the one we know today. 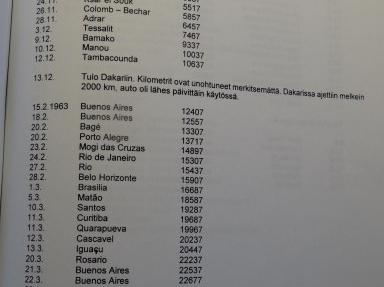 Eki has also detailed all his flights, with the date, origin and destination all neatly typed in. Some of the airlines no longer exist, while some of the old airplane types, the Comets, the Tridents and the Caravelles, will make the aviation enthusiasts’ mouth water. He is near 2000 flights in total, though his calculation methods seem to differ from mine – he counts a flight with a stopover as two flights. We agree to disagree. Eki insists on driving me back to the centre as the day slowly gives way to the night; the winter is approaching and so the hours of daylight are progressively fewer. But for Eki this is absolutely not an issue. He has driven everywhere in Europe and far beyond, and has never stopped. A short hop from Espoo to Helsinki is entirely routine. We say goodbye and I truly hope we will soon meet again. 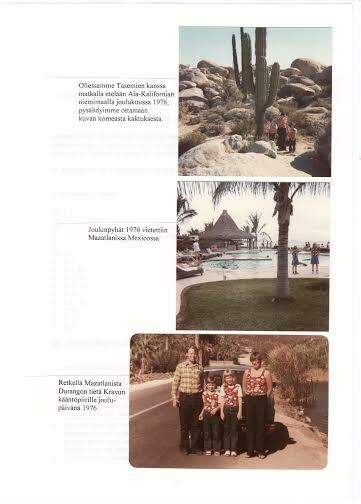 There are too many maps to study in depth, travel albums to try to understand (in Finnish!) and flight paths to marvel upon which demand more time. And I do feel that Eki, who doesn’t have a website and rarely gets a chance to share his incredible trails with the world, has a world of stories yet to tell in detail. Like the one where he was detained by the Egyptians near Sharm El Sheikh. In 1955, prior to the 1956 war, the whole area of Sinai was a military area, where not even Egyptian civilians were allowed to enter. He was imprisoned for two weeks and in the end he, and the motorbike were released and we were allowed to drive to the Suez Canal and into normal Egypt. Eki truly recalls a world that no longer exists. We younger travellers owe more to him that we are aware of. The photos in this article are either from Eki's collection or taken in his home by Harry Mitsidis on October 13, 2014.